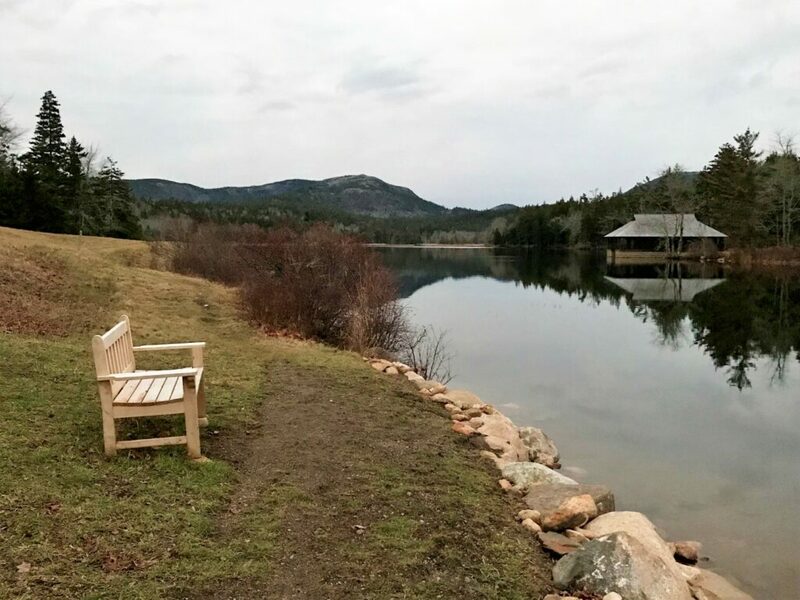 Located next to Acadia National Park, the preserve offers more than 1,000 acres of trails and gardens. Outside of the 31,000 acres of Acadia National Park on Mount Desert Island are a handful of other, much smaller conservation lands that are worth some leisurely exploration. One of my favorites is the Land & Garden Preserve, which ranges from Northeast Harbor to Seal Harbor, on the other side of Somes Sound and just a 15-minute drive from my home. Nine miles of trails crisscross the idyllic 1,165-acre landscape of the Land & Garden Preserve, which includes Thuya Garden, Asticou Garden and the Abby Aldrich Rockefeller Garden. A dozen miles of carriage roads also are open for foot travel and equestrian use, but bikes are not permitted. Dogs are allowed off leash and under control, although not in the gardens. The Land & Garden Preserve increased dramatically in size on June 12, 2015, when David Rockefeller Sr. donated 1,022 acres of meadows, woods and streams around Little Long Pond in celebration of his 100th birthday. The land, purchased by his father, John D. Rockefeller Jr., in 1910, abuts Acadia National Park. This hiker wholeheartedly concurs with Eliot’s assessment of the Little Long Pond vista, which looks north along the valley of Jordan Stream to the craggy upper reaches of Penobscot Mountain. The two-mile circuit around the 38-acre expanse of pond has become my go-to hike when I want to get outside for a quick bit of exercise and some easily won scenic views. From the stone wall, gate and kiosk on Route 3, just opposite Bracy Cove and the view out to Sutton Island, I like to head up the east side of Little Long Pond on the carriage roads, a route that wends through fields and then woods, passing a lovely old boathouse halfway along the pond. North of the pond, I will take either the Jordan South or Jordan North spur to cross Jordan Stream, which flows south from Jordan Pond, then turn south to complete the walk down the west side of Little Long Pond. The carriage roads in the Land & Garden Preserve are an original part of “Mr. Rockefeller’s Roads,” a 57-mile system of classic broken-stone roads and 17 unique stone bridges constructed between 1913 and 1940, all financed and supervised by John D. Rockefeller Jr., perhaps his most important Acadia legacy. Since the recent Rockefeller land donation, quite a number of trail improvements have been made, according to Tate Bushell, the natural lands director at the Land & Garden Preserve. The Harbor Brook Trail, which extends 1.6 miles from Route 3 to the Asticou & Jordan Pond Path, has three new bridges and lots of new bog bridging. Parts of the trail also have been rerouted away from wet areas and received extensive bench cutting. The Richard Trail, an east-west path that allows for a variety of loops, has been extended across the Preserve from Thuya Garden to the David and Neva Trail at Little Long Pond, a distance of 1.3 miles. The trail is named in honor of David Rockefeller’s son, Richard, who was killed in a small plane crash in 2014. The trails on 450-foot Eliot Mountain are thought to be some of the oldest on Mt. Desert Island, dating to the late 1800s. The mostly wooded peak offers limited views but is nonetheless a fun area to wander about. The many old and often confusing trail signs on the mountain have been swapped out for new ones that reflect several new trail names. The Land & Garden Preserve is open year-round from dawn to dusk. Come summer, you’ll want to visit the three gardens as well as Thuya Lodge, the former home of Joseph H. Curtis, an early 20th-century summer denizen. For more info and a trail map, visit gardenpreserve.org. Carey Kish of Mount Desert Island is the author of AMC’s Best Day Hikes Along the Maine Coast and author/editor of the AMC Maine Mountain Guide. Follow Carey’s adventures on Facebook @CareyKish.